Soybean is acquired from an annual dicotyledons & leguminous plant, scientifically known as Glycine max. It belongs to Fabaceae. Soybean is native to East Asia and widely cultivated in India, U.S., Brazil, Argentina and China. It grows well under moisture, nutrient rich and well drained soil. It takes 120 days for fully matures from plantation to harvest. Soybean oil is extracted from soybean seeds through solvent extracted methods. 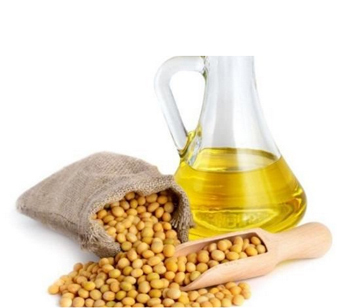 Properties: Soybean oil is clear dark yellow or faint green color. It is neutral in taste and having high smoke point. Soybean is constitutes of stigmasterol, sitosterol, campestrol, brassicasterol and linoleic acid & linolenic acid. Soybean oil is well mixed with other essential oil such as sea buckthorn oil, rice bran oil, sesame oil and peanut oil. Soybean oil is widely used in cooking as it provide necessary fatty acids and also regulate cholesterol levels. Soybean oil also prevents cancer of breast and prostrate. Soybean oil is effective against Alzheimer’s disease because of its Vitamin K content which acts as an antioxidant against free radicals. It promotes bone health, it stimulate regrowth or increased healing of bone and prevents osteoporosis. It encourages healthier vision by acting as antioxidants and neutralizing free radicals that can cause macular degeneration and cataracts. Soybean oil improves appearance of blemishes, reducing acne scarring, promote healing and prevents sunburn. Soybean oil contain Vitamin K which helps in eliminate free radicals that cause cancer, premature aging, cognitive and heart diseases. Soybean oil is similar to peanut allergies so avoid use of soybean oil if anyone with peanut allergies. Identification : Meets the requirement of the test for fatty acid composition. Alkaline Impurities : NMT 0.1ml of 0.01N HCl is required. Description : Clear pale yellow liquid. Solubility : Practically insoluble in ethanol (96%) miscible with light petroleum. Storage : In a well fitted container at a temperature less than 25°C.